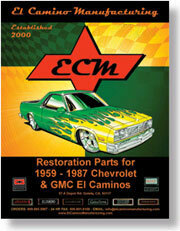 This is the original molding that came in all 1978-87 El Camino's. It has all the grain texture and stitching just like when the car was new. Comes with the snaps for attaching the storage curtain. This part is 100% correct because it is made with original General Motors tooling. Mounts under the rear window behind the seat.